My blog features personal stories of fatherhood. I share thoughts and revelations, struggles and successes, and overall feelings and emotions I encounter on my journey through fatherhood. In truth, I did more of the LSD that Coach Turner required than the type that was first popularized my Dr. Albert Hoffman and Owsley Stanley. During formal team practice, and on evenings and weekends, before, during, and sometimes after cross-country season, I was out on the roads for long, slow 6, 8, and 10+ mile runs. I even dedicated a week during my summer breaks to attend Mid-Ohio Cross-Country Training Camp, a chance for my coach to charge me and other high school runners for taking us on long runs through rural areas. My running helped to shape my identity during high school: endurance athlete, letterman, leader, jock; all the while balanced by: partier, prankster, and to some extent scholar. The athletic aspect was cut short my senior year when the partier part caught up with me and I came down with infectious mononucleosis that ended my run, so to speak. 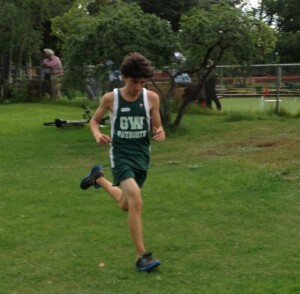 Perhaps the unrealized potential of my senior season of cross-country contributed to my excitement when my son went out for his team as a high school freshman last year. At the first suggestion of his interest, I reached out to the coach, who by some mystical connection is also named Turner. I asked about how my son could prepare for the season and when practice would be held. My interest was in part to help encourage my son to start training; I knew full well that all of my personal experience would not be enough to get him out on the roads and into shape, and I hoped the influence of a coach would hold some sway. As practices began, I was helpful and diligent about getting my son to and from the workouts. Of course, I offered a few suggestions from my running experience, but as a teen he chose not to actively regard most of them. In spite of minimal training, he fared pretty well at the first few meets. I was impressed by my son’s ability to endure a modicum of discomfort and to stick with the sport, even as he was also keeping up with his schoolwork and getting involved with a theater production. Yes, I have to admit, I was pleased and even proud to say that my son was following in my Nike-clad footsteps by running high school cross-country. Anytime anyone asked about the transition to public school, I was quick to say that in class and out he was thriving. So imagine my confusion and reaction on the first Saturday that he had to choose between an optional cross-country team workout and a theater call to build sets for the fall production. You’ve guessed that he went to the theater; you can also guess that it took all I could muster not to challenge that decision. Based on my own experience as a team member, and the commitment I’d made to running, it made little sense, and I could not justify my son’s decision. But it was his, and I let it be. Theater soon became his passion. My son balanced and complemented his academic success by serving several roles, on stage and off, and ended up being elected to both the Thespian Society and National Honor Society. I am proud and pleased by this balance and commitment, and all the more so because my son’s out for the cross-country team again this, his sophomore year. His priorities are the same, however, and so this afternoon he’ll skip practice with the team to audition for the fall production. He explained this choice while behind the wheel of our car, as he drove me to school today. Like father, like son, it’s a long strange trip. The Wheel: Fatherhood Turns Full-Circle, again. A 12 Month Plan for Being the Best Grateful Dad! Sign up with your email address to receive news and updates and receive a free chapter of The Grateful Dad's Guide to the First Year of Fatherhood for free!